This accessory kit was assembled with the wood turner in mind. It includes a stone dresser to change the grains on the grinding wheel for fine abrasion and a jig and grinding support for rough turning and hollow turning tools. 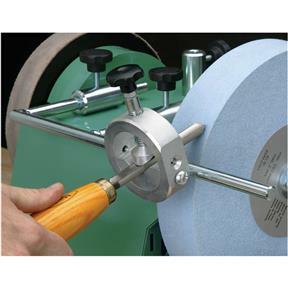 The jig and grinding support provides perfect results on oblique edges and hollow chisels.For use with T10010 and T10097 wet sharpening systems. This accessory kit was assembled with the wood turner in mind. 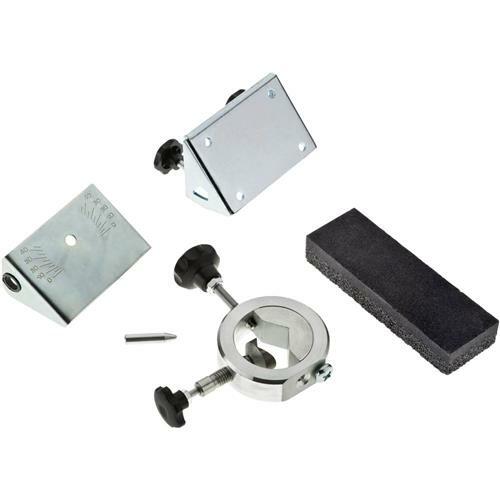 It includes a stone dresser to change the grains on the grinding wheel for fine abrasion and a jig and grinding support for rough turning and hollow turning tools. The jig and grinding support provides perfect results on oblique edges and hollow chisels. Easy to use. Everything you need in the box. Makes sharpening gouges very easy and accurate. Very easy to change angles. Sharpening shew chisels is a little more complicated. Good value, good product. After a little practice I am finally achieving a super sharp edge on my gouges!